When Anytime Pale first launched at Temple, it was given the style tag session IPA, being a beer that packed that little bit more a punch than a pale ale but didn’t have quite the level of booze as most IPAs. It's a beer that has done particularly well for the brewery, having picked up several medals at the Australian International Beer Awards, including a major trophy in 2015. 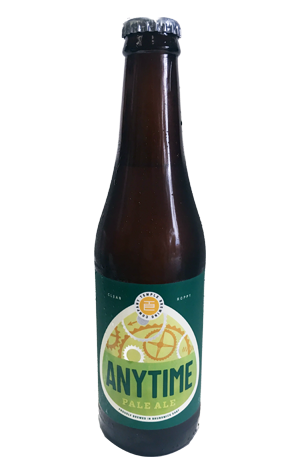 The beer has since been rebranded to, simply, the Anytime Pale Ale, due to some confusion from drinkers as to what it was – a pale or IPA. What the beer has retained is its hop flavours and aromas of citrus and pine with a clean, light and dry body designed. presumably so it can be enjoyed anytime. Chock full of aromatic New World hops but weighing in at a restrained 4.7 per cent, it's typically Temple: flavoursome, balanced and finishing nice and dry - the sort of beer that should go down nicely anytime, in fact. Since its launch, the beer has been tweaked by new head brewer Glenn Harrison, with a switch of yeast unlocking even more hop aroma. The result was a major trophy at the Australian International Beer Awards 2015. Most recently, with some confusion from drinkers as to what it was – a pale or IPA – they decided to rebrand it as, simply, the Anytime Pale Ale.